This baby dove comes 12 doves per box. Light and soft decorative baby dove gazes right and has two pearl beads feature on its head. 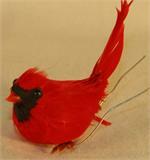 This a fat red cardinal decorative bird, with the tail up in the air, is a very popular item for decorating with birds. At 12 birds per box it is also a great value. They are about 4.5 inches long and look stunning on wreaths. This a hallmark decorative bird! The red male cardinal, fat and healthy, perches with tail down it is about 4.5 inches long and sold 12 birds per box. A great accent for wreath ideas, including wreath making and many different decor projects. 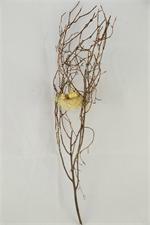 This is an adult sized white dove decoration about 5 inches long and is sold 12 birds per box. With wings extended, this feathery decorative white dove can be used on evergreen boughs, wreaths, or ribbon crafts. This is another of our most popular decorative bird. 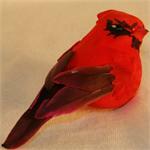 It is a red male cardinal and has lifelike feathers and a fuzzy back end. It is about 5 inch long and is sold 12 birds per box. The striking color looks great on wreaths and evergreen boughs. 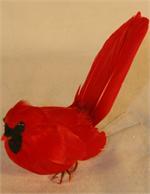 This large mushroom cardinal, a strong decorative bird, is about 3 inches overall in length and is sold 12 birds per box. Decorative cardinal is looking to the left. These birds are beautifully hand painted and assembled. There are four species per box 12 total birds per box. Small Mushroom Cardinals with attached wires. This a female cardinal in the small baby size, approximately 2.5 inches long overall length. Sold 12 birds per box for all of your wreath making, wreath ideas, and projects decorating with birds. This delightful small mushroom cardinal adds flair to your wreath ideas where you will be decorating with birds. These are wonderful hand painted cardinals. Sold 12 per box, there are plenty of decorative birds for all of your wreath decorating projects.